Time for the February vertical on Whisky Rover. We’re back on Speyside and faced with a wealth of possibilities I’ve plumped for BenRiach. Why? Well, since the new ownership in 2004 the distillery has gone from strength to strength. It’s been assisted by a strong core range and special one-off annual releases, offering an assortment of ages, cask finishes and marketing trends. Regardless of where you are in the whisky world, the chances are you’ve noticed what’s going on at this distillery and now is the opportunity to explore further. Yes, there is a huge range of possible BenRiach’s when you look closely at what to consider with a vertical tasting. Keeping to my usual ten assortment I’ve gone mainly with the official releases because simply there are so many! The future looks incredibly bright for BenRiach after a history littered with closures and changes in ownership. Nose: very little seeking out some pears, apples, a used matchbox, some almonds and that's it! Taste: watery is the first impression and young. Flour of all things, some pepper and a little cream. Overall: pretty poor in my opinion. If this is the Heart of Speyside as suggested we'd better rush it into the nearest cardiology clinic. I won't be sitting down with this whisky ever again, hopefully. Nose: apples and almonds with pears and straw. Taste: a classic Speyside expression with apples, white pepper, tablet and pineapples. Overall: perfectly acceptable and very sugary. A solid dram for any evening. Nose: beetroot and chocolate brownie so a real richness here. Sandpaper - yes I know! Roast beef straight from the oven. Apricots, toffee, black pepper and peated orange. There's also bacon Frazzle crisps which also possess that oily characteristic. Taste: crackling and a vegetative quality. Coffee beans and a bitterness of dark chocolate. There is an odd after taste almost soapy in nature and certainly watery. Overall: the peated one and I found this to be disappointing. 10 years old and even at 46% strength it tastes weaker and watery than I was expecting. A young peaty buck should have plenty of fire in the belly rather than this shallow experience. The nose is almost there though I must say in its defence. Nose: it's summer season again and the Scottish raspberries are being picked. That's the main aroma here. Beneath some figs, plums cherries and lots of cream. A very light example of sherry. Taste: more raspberries and cherries with a fairy cake also noticeable - so that'll be vanilla, cream and a light sponge. Coconut finishes off the limited but perfectly pleasant tasting. Overall: an engaging example of what sherry can do but remains light and well balanced. One I'd suggest as a starter sherry dram for anyone wishes to explore outside of the usual ex-bourbon casks. Nose: vanilla, olives and white pepper. Yes some honey again, classic Speyside I suppose with applies also. Taste: more apples on the palate, with the vanilla returning alongside the honey. A little tablet and nutmeg but very shallow and limited. Overall: I'm finding this one a little, well, dull really! It probably represents a steady drinker for some enthusiasts but I want my whiskies to say something rather than lurking in the corner. Nose: really laying on the thick honey here. Gooseberries in the mix, coconut and sugary marmalade. That'll explain the orange peel and a squeeze of lemon. Golden syrup and a dash of rose water. A real sweetie. Taste: digestive biscuits, a rich vanilla fondant icing and more honey. Overall: quite punchy and I'm feeling Marsala cask here has swept away any subtleties that the palate once offered. I'm thinking of a modern renovation that has removed any period details. Interesting, but not one I'd return to. Nose: vanilla, a little rock salt and balsa wood that captures the light airy freshness of the whisky. Beyond some oats and a little cream but that's your lot. Taste: a malty hops characteristic with honey and more vanilla. Some black pepper and a slight bitterness from the wood. Overall: a very disappointing whisky even with its attractive price tag. After 20 years I expect layers of flavour and aromas. Instead its more like a single than an album. Thoroughly disappointing and instantly forgettable. Nose: a peaty bog with sea water thrown in somehow. A honey glaze from the barbecue with the last hurrah of those dying embers. Some pineapple and pepper trying to break out. Taste: well its smoky and this engulfs everything else on the palate. Too much peat, a little water does help matters but confirms there isn't much beyond the honey and vanilla we're seeing throughout this vertical tasting. Overall: it's a big bold whisky but that necessarily doesn't mean it's great. I'm struggling to strike up any appreciation for this example. Yes its does the peat aspect well but it feels unbalanced and there are better - more layered - whiskies out there for less. That concludes another vertical tasting. 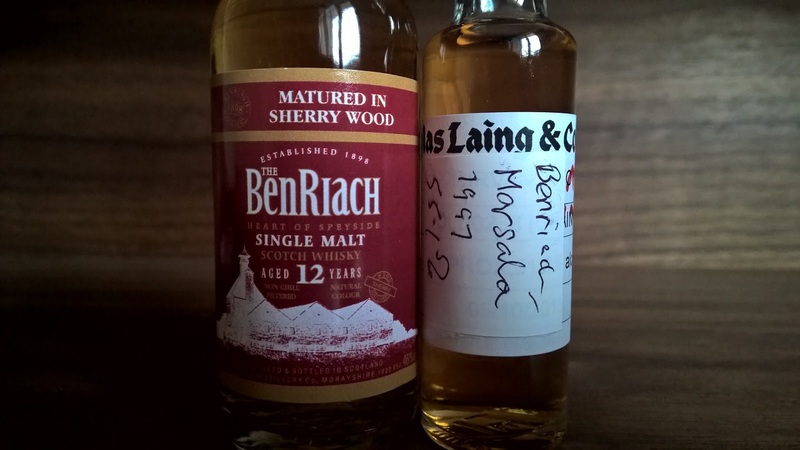 I'm left very underwhelmed and disappointed by my BenRiach experience. I can see why they release an assortment of whiskies annually with a variety of finishes - clearly the standalone ex-bourbon cask whiskies are somewhat lacking.